It's astonishing how quickly building work progresses. One minute the back of the house is still standing, and the next, voila! The corner of your daughter's bedroom appears to be hanging in mid air. Here's the view from the new extension looking towards where the bay window used to be. You can see the shape of it in the steel in the ceiling. Tom the builder assured me that the steel and the three props were sufficient to support the house above, but nonetheless they welded the main supporting pillar into place by the end of the day. The pillar is located where the left-hand corner of the bay window used to be. In the not too distant future, it will be built into our new kitchen peninsula. In the picture above, the gap between the pillar and the wall on the left is what *used* to be the wall between the chimney breast and the left-hand corner of the bay window in the picture below. Our two monkeys enjoyed the obstacle course the builders obligingly left in place over the weekend. There's a lot less wall, that's for sure! The builders are currently busy installing the roof. The bifold doors, windows and roof lantern go in next week, and then they move inside and start knocking the internal walls down. Bring on the dust! Click here to leave a comment, if you like. 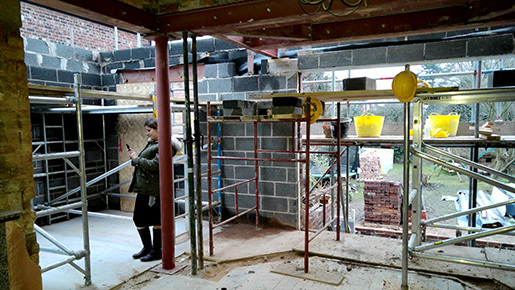 You can also see all posts about the progress of our extension here.